“We couldn’t change his past… but we could rewrite his future.” This touching short video inspired by real-life rescue stories just might encourage you to adopt a rescue horse for yourself. AWA Productions is currently hard at work on the upcoming documentary Finding Forever Homes — you can learn more about that project in our Q&A with producer Karl Henricksen. 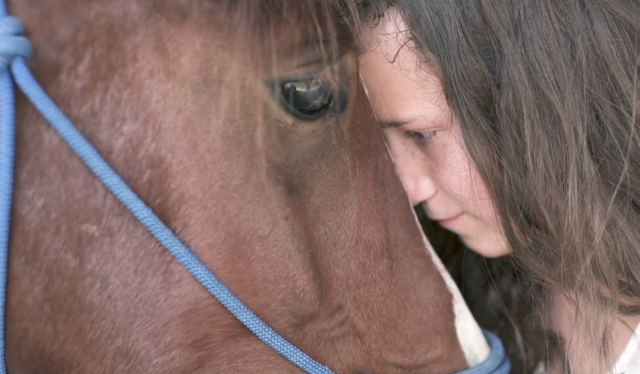 The documentary originally began as a shorter film project, but as Henricksen and director Clarissa Duque further explored the issue of horse rescue and adoption, met individual humans and horses at the heart of the issue at L.E.A.R.N. rescue in South Carolina and began following the story of a group of horses from rescue to rehabilitation, they quickly realized that there was scope for a feature-length documentary. To learn more about Finding Forever Homes, follow the project on Facebook. We’ll continue to share news and updates as the documentary gets closer to its release later this year! Go rescue horses. Go riding!